There are certain magical “firsts” in life – riding a bike without training wheels for the first time, losing your first tooth, and reading your first book all by yourself. This past week, my two sons discovered the magic of Broadway for the first time, courtesy of The New Victory Theater’s productions of Grug and The Mark of Zorro. While it is too late to catch The Mark of Zorro, there is still time to see Grug, which runs through March 17. Grug, which is intended for children ages 2-5, is based on the popular children’s series by Ted Prior. The character and title of the play, Grug, springs into existence when a Burrawang tree topples over and transforms itself into the puppet. Three actors from Australia’s Windmill Theater bring the puppet to life as he builds a home, plays with puzzles, and makes other friends. The actors do a tremendous job keeping young viewers engaged and captivated by the story, encouraging audience participation and movement. 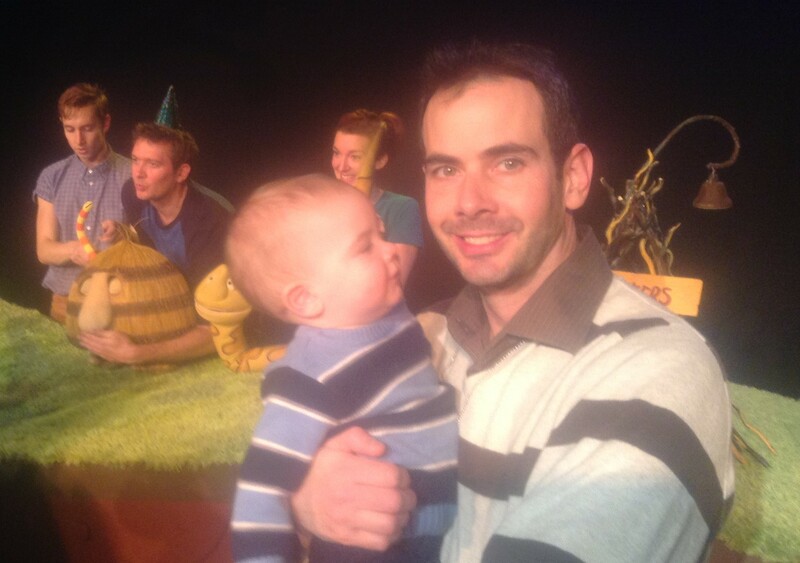 My son was completely fixated on Grug and the actors as they performed. For the entire show, my normally non-stop one-year-old sat mesmerized and thoroughly entertained by the actors and puppets. He wasn’t the only one – I was entertained myself and thrilled to see my child so enthusiastic about live theater. Grug runs at the New 42nd Street Studios, an intimate theater space. Like its sister location, the New Victory Theater (a beautiful 499-seat, historic, jewel box theater), the studio is designed with families in mind; there is stroller parking in the lobby, healthy snacks for purchase, and pre-show activities related to the performance. Prior to the show, children camped on the floor with crayons, coloring pictures of Grug and mailing him letters. Grug is 45 minutes long with no intermission, and includes time to meet the performers before the show. What The New Victory Theater is doing for children’s theater is amazing. The high-quality actors-storytellers-breakdancers-puppets-rockstars-performers, and the material they bring to life, are instilling a love and appreciation for theater in children at an early age. And I’m witnessing it firsthand in my children, for which I am incredibly thankful. To check out upcoming shows at the New Victory Theater, click here. And if you buy tickets to three shows at once, you automatically become a member and save 35% on your purchase at The New Victory and 30% at the Duke on 42nd Street. To learn more about becoming a member and the privileges it brings, click here. *This post can also be found at The New York City Dad’s Group website at www.NYCDadsGroup.com.